The Imagine It! Children's Museum of Atlanta promised hours of exploring and learning. 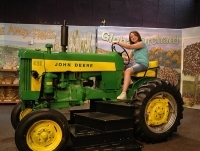 Aimed at children under the age of nine, the museum contains exciting interactive exhibits such as the Curious George Gallery or Healthyville. Children also get the opportunity to paint the walls, crawl through a playground, or even don a raincoat and play in a forest stream. Opening times: Open Monday to Friday 10am-4pm; Saturday and Sundays 10am-5pm. Closed Wednesdays. Closed Thanksgiving and Christmas Day.